My third still life, "Lenin: or, Bust" (10 February 2018). Creative Gunning's Fine Art Classes are taught by Margarita Georgiadis at the Tony Foley Centre in Gunning. For more information, check out the details here. There are two things that cramp my creative style: having to drive too far to get to the place of work, and being distracted by other things when I get there. Creative Gunning's Fine Art Classes remove both of these barriers and after only three weeks, I feel like I might actually be able to draw! 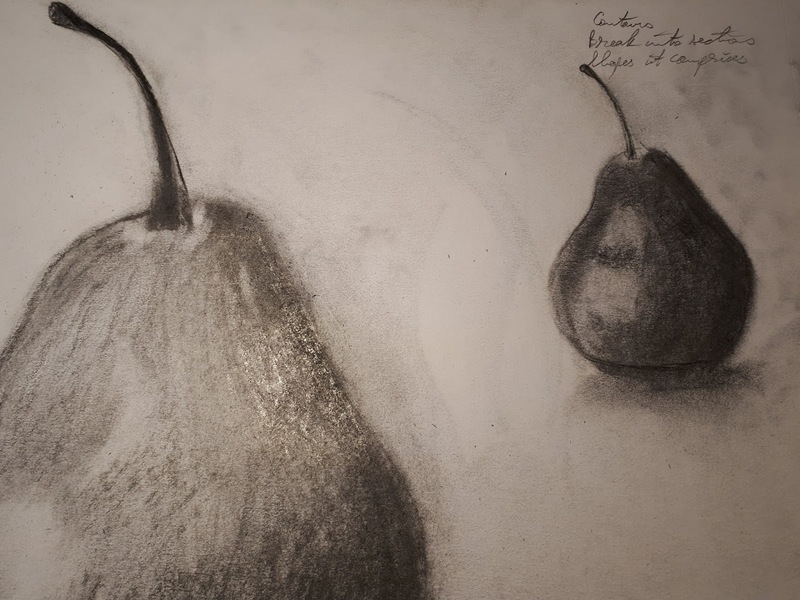 My first ever still life, "Pear" (13 February 2018). I did technical drawing at high school up until year 10, but I messed about and, although I enjoyed the drawing, I lacked the discipline and dexterity to do it well. That is not to say that I have not used these skills when building chook pens and other garden structures, but it is always functional rather than pretty. I have always wanted to draw but felt I lacked talent. Until recently. 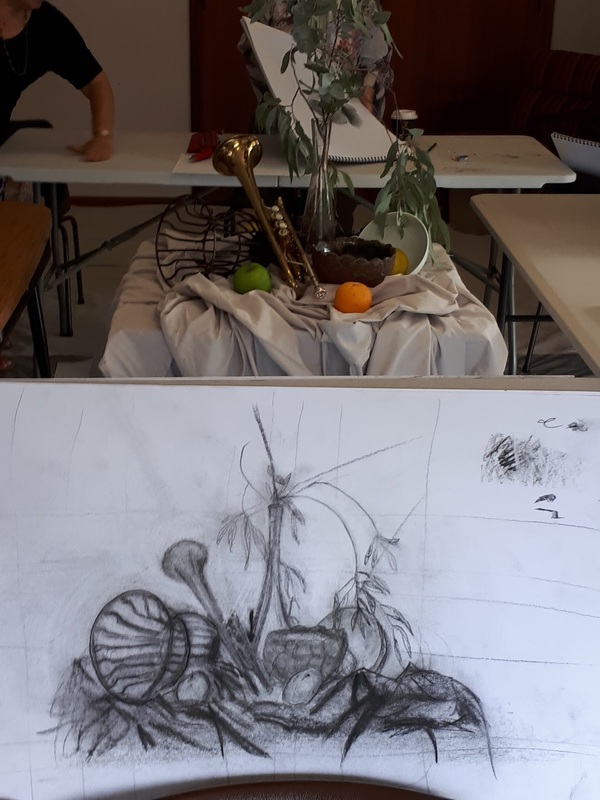 Internationally acclaimed Australian artist Margarita Georgiadis is currently conducting beginner classes in drawing on Saturdays from 10am to 1pm at the Tony Foley Centre in Gunning. 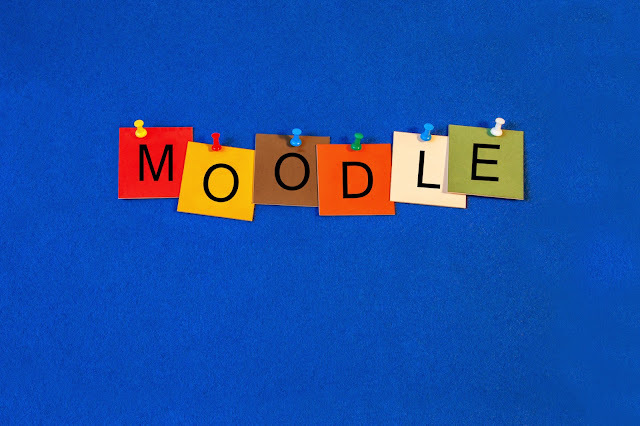 More classes are due to commence soon, including an intermediate course. I decided to give the classes a go and I am having a blast! In the first week, we began by learning to draw circles. The trick is to use your shoulder as a pivot, rather than your wrist. I also learnt to hold my pencil in a way that I would never have done if learning by myself. It was strange at first but one picks it up quickly. We learnt how to use "construction lines" to keep the size of our circles consistent. hours to get it to this stage. After learning to draw circles, we were given our first still life to try. I chose a pear. Shock of horrors, it didn't look too bad. We learnt how to add contour lines to bring out the depth and shading to indicate the light. I was so pleased with my pear, the next day I practised another still life, this time using my Falcon pipe as my subject. For the second week, we were asked to bring a favourite object we would like to draw. 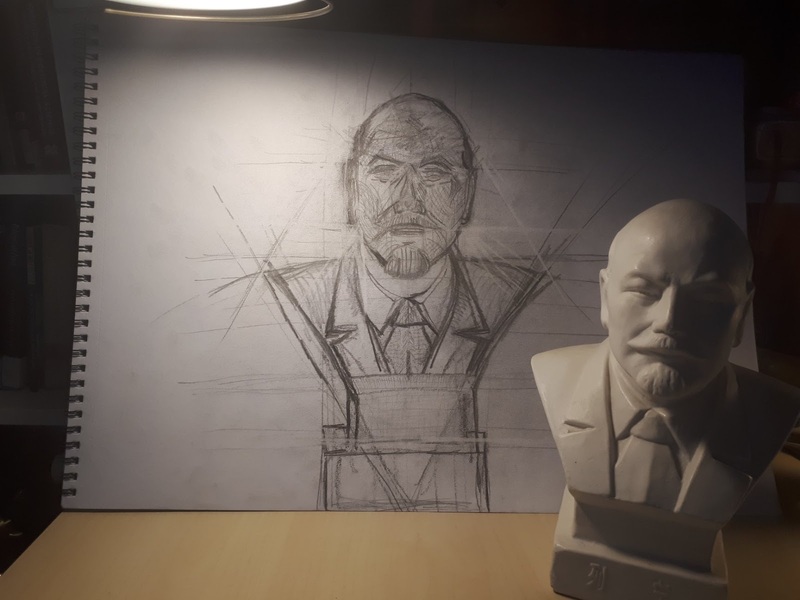 I racked my brain to think of a "favourite" object, and settled on a bust of Vladimir Lenin. I bought this in Antique Street, Soho, Hong Kong, and I like it because it has Chinese symbols on the base. At the beginning of the second class, we began by learning how to draw ellipses. Using construction lines and our circle-drawing shoulder technique, we drew ellipses of varying sizes, using a plastic cup for perspective. 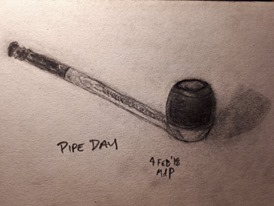 My second still life, "Pipe Day" (2 February 2018). Next was our object. Mine turned out to be rather difficult. But we learnt more about construction lines, and this time, we were not allowed to use our eraser. Except, of course, when one uses one's eraser to create construction lines. Soon enough, my drawing began to take shape. I was happy with the outcome, although I did run out of time and have not found the time so far to go back to it. The third class was held on 24 February. The first thing we did was to imagine a bowl, and, using our ellipse-drawing technique, we were to draw our bowl. 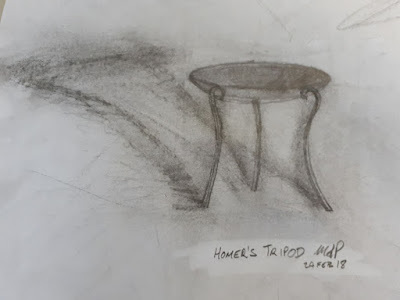 I have been reading Homer lately, and my first thought of a bowl was a tripod. My fourth still life, "Homer's Tripod" (24 February 2018). The Ancient Greeks would give tripods (basically, a bowl with three legs used for cooking or whatever, depending on the style) as gifts and trophies. In Homer's The Iliad, for example, Achilles includes tripods in his list of prizes for the winners of Patroclus' funeral games (after Patroclus had been killed by Hector). Once again, I dreamt up the most difficult thing to do. But with a little help from Margarita, "Homer's Tripod" started to take shape. For the final two hours of the class, a complex still life was revealed. The display consisted of a vase with gum leaves, a model train, a trumpet, some fruit, a couple of bowls, and a metal pot plant holder, and some drapery. It looked over-whelming. And this time, we were to use our compressed charcoal. I had never used this before. 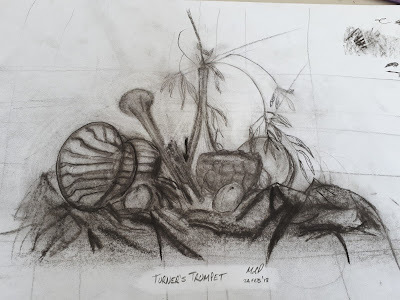 Yet, two hours later, "Turner's Trumpet" emerged. The drawing is far from finished, but I am still in shock that I did this, in the time allotted, and I really like charcoal! My fifth still life, "Turner's Trumpet"
When I think back to when I used to draw, I can only recall as a young child, less than ten years of age, when I would draw amphibious landing battle scenes based on the advertisements in the back of DC Comics. (Remember the "sea people" adverts? These "sea people", otherwise known as brine shrimp, featured on an episode of South Park.) Either the sea people or a toy soldier set was a common advertisement on the inside cover of DC Comics books when I was a kid. I used to draw the battle scene. Well, since then, I once drew a picture of a scene in my house when I should have been doing something else, and another time I did a drawing of my pets on a home-made birthday card. And that's it. To put it another way, in three lessons, I have drawn more than ever before. And this is what I enjoy about Creative Gunning's Fine Art Classes. Margarita has everyone drawing on the first day, and in three lessons, I have several drawings to my credit. They may not be the greatest, but I can see that, upon completion of the beginner's course, and with a little practice, I will be able to add drawing as another hobby for rainy days like today. From what I have learnt so far, it is all about the structure. 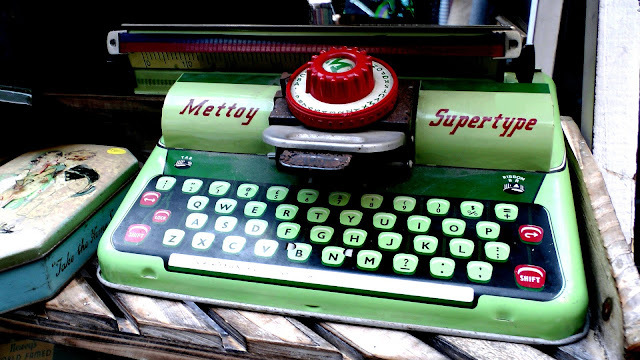 Much like essay writing, getting the structure right first leads to a competent outcome. The style and finesse will come with practice. But I highly recommend Creative Gunning's Fine Art Classes, and Margarita is an excellent teacher! For further information, see the Creative Gunning Facebook page. The next beginner's classes commence on 5 March 2018 at the Tony Foley Centre.